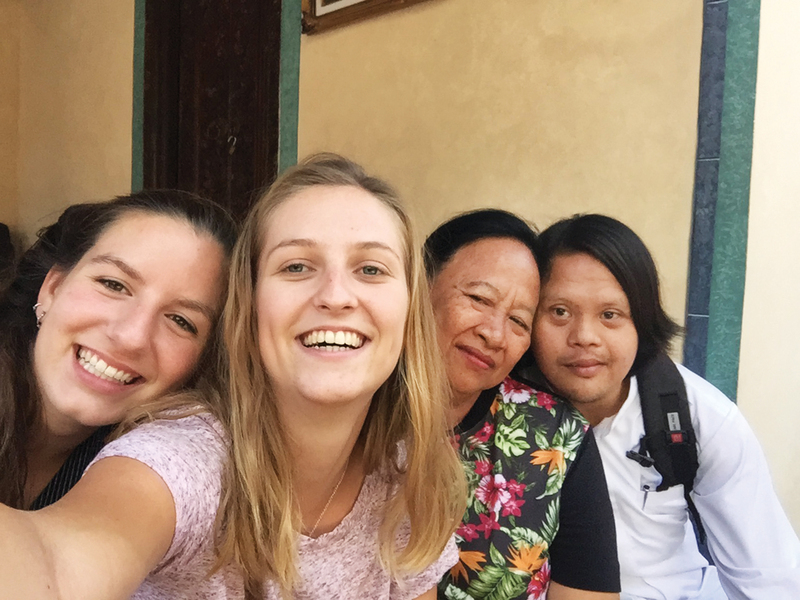 Writer Stephanie Brookes shares a heartwarming tale from Bali about a couple of university grads from the Netherlands who are helping special needs children find their voice through photography and art. “I watched a documentary called Born Into Brothels a year ago, and it struck a chord,” Merel Van Den Berg explained, “It was about a project that gave the children born into brothels in Calcutta a powerful way of showing others how they saw the world. In other words, it gave them a greater voice.” This inspired Van Den Berg and her friend Simone Karssen to hatch a plan for a photo-based project in Bali. They decided to implement a similar “photo voice” project as part of their study at Sjaki-Tarus-Us, a school in Bali for children and young adults with special needs. Van Den Berg, who comes from the Netherlands, spent five months in Bali during 2016 and 2017, completing an internship at Sjaki-Tari-Us. She was encouraged by the interest she received from people she knew in Bali to develop a similar idea and undergo a “photo voice” project. She returned to the Netherlands, but found it hard to settle back home and yearned to return to Bali. In the Netherlands she discussed ideas on how to get some cameras for the special needs students. Van Den Berg discussed more details with her university roommate and fellow classmate Simone Karssen, who felt inspired and wanted to collaborate. Both were undergoing studies in Socio-Cultural Development, and Karssen had been working at a school with special needs children in Holland and felt that working with Sjaki-Tari-Us could help expand her horizons. They flew to Bali in September 2017 to begin work on the photo project. They also received support, help and encouragement from their mentor Toinette Loeffen, a woman already creating very inspiring work with special needs individuals in the Netherlands. The Do You See What Eye See Project had sprung to life. The seven students at Sjaki-Tarus-Us were given cameras. They were encouraged to photograph what they saw in their daily lives and to record the beauty of their world. They were given tips and guidance on how to use the camera, and total freedom to decide what to record. Drawing and painting classes further stimulated their natural creativity. The participants showed enthusiasm and surprising aptitude in expressing themselves through their photography. This was evident in some of the remarkable images they produced. It matched the goals of the project as photography was used to empower the participants. From it, there grew a wider acceptance of people with special needs by the local community. A deeper level of respect was evident in attitudes, and a positive image was created. This really gave honour to the students as evident in Romi’s story. Romi is an 11-year-old student. He lives in Klungkung Village and has been going to Sjaki-Tari-Us school for one and a half years. He has a happy disposition, and he loves to learn. Romi knows that he is different from other children. He wants to be normal, and asked his mother to take him to the doctor because he had the feeling that something was wrong in his head. His doctor explained his condition, and he understands more about himself now. When a lesson is too difficult, he now has the confidence to speak out and seek help. Romi likes to take photos of objects, and he produced some beautiful photographic images of flowers, which have a particular significance for him as they are used frequently during ceremonies in Bali. The project culminated in a professionally mounted exhibition launch at Taksu Photo Gallery on December 22, 2017. It was attended by 50 people with attendees including the exhibitors, who brought family members from their communities as well as many of those who had supported the project and other special guests. Van Den Berg and Karssen spoke on the night. They said that, like the participants, they too were students and had learned so much. They added that the project had built up their professional confidence and provided a new career pathway. They stressed that, more importantly, the project was able to demonstrate achievements and growth among participants and the value of further initiatives to enhance self-expression and self-development among people with special needs. It goes to prove how with no experience and just a passion and an idea, you can achieve so much in this world. Stephanie Brookes is a travel writer and blogger with tales from Indonesia and beyond.